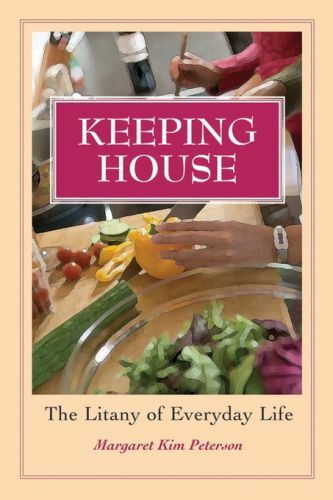 Keeping House : The Litany of Everyday Life has to be one of the most thought-provoking books on keeping home that I have ever read (and was, in fact, part of the inspiration behind Living Like a Narnian.) A friend of mine from church kept telling me I really ought to read it and I kept saying I would and that I wanted to. At the beginning of the year I finally told her I'd take the time to read her copy and once I cracked open the covers I seriously wondered what was wrong with me for having taken so very long to get to this read! As I told some people, if I were in the habit of saying that certain books made my soul sing, this would have been one of those books and one of those occasions! It really made my soul sing! It isn't a book about being a wife or keeper of the home. It isn't about organizing your closet or making a delicious dinner. It also is all about those very things and why they are so important - whether you are married or single, have children or are an empty nester. It is a book about housework and why "having to" do it should not be viewed in a negative light. Quite the opposite in fact! It is positive encouragement to tackle the laundry with joy and gladness, with plenty of good Biblical examples as to why this should be so. Author Margaret Kim Peterson is straight-forward, easy to understand and completely practical. Instead of telling you why you should read this book, I'm just going to quote from it. This is not a book I have thoroughly thought-through and applied. It is in the process of being mulled over. Perhaps some of these quotes will cause you to give pause and give thanks for the daily chores which are full of meaning, even when they disgust us. I hope I never clean a toilet bowl in the same way again. *I cannot tell from the notations who the writer that she is references is. "Wearing, and providing others with, clothes appropriate to the season of the year is a way of living in harmony with the God-given character of our surroundings. We all know small children who resist wearing a jacket when it is cold out and have to be reminded that in winter, we dress for winter. But adults can find this a challenge too. I read a newspaper article once about a fashion trend that involved adult women wearing short, thin dresses in the middle of northern winter. I don't remember how these women were said to have avoided frostbite, although presumably they didn't spend much time outside in these outfits. "Handwork is an art that binds people together across generations. The things we make can also form bridges between individuals and generations. Yes, I will be returning to this book many times in the future, I'm quite certain. I hadn't heard of this, but I like books like this that inspire me in everyday life. Hmmm, I might even want to read this one. And my mom would definitely want to, I think. It appears that you go to our church. You are welcome to borrow my copy if you wish. I appreciate the quotes and your comments, I am putting this book on my list to read! @Taia: Thanks! And I do go to your church. I'd love to borrow it. I've seen this one before and it caught my attention, but I don't remember where. It's definitely going on my reading list now, though. It sounds like something I really need to read! This sounds like a terrific book -- good reading for someone in my time of life! Thanks for the review, Carrie. As I told you, it's been on my list for a couple years now! I like the encouragement of the inclusion of children in housework. I know it takes longer with little hands, but it really can be a bonding experience. For me, the bonus that my daughters are FAR better about remembering what gets washed on the cold cycle has been great. As we work together on the "fabric of daily life", we find ourselves talking about things from the mundane to the profound. Perhaps this is what "quality time" really means. Ok, so I'm intrigued. Clicking over to amazon to add it to The List. Hmmm, this sounds intriguing (certainly more so than the Hunt book!). I wonder, have you read Edith Schaeffer's book--the Hidden Art of Homemaking? I wonder how it compares. . . The author is a professor of New Testament studies and her husband uses a wheelchair. It doesn't sound like she has an immaculate house. I e-mailed with her and she's from near where I'm from in Iowa. She was widowed in her first marriage (book is Sing Me to Heaven) so I don't think housekeeping reaches the level of "guilt-inducing"- she has bigger fish to fry. This book didn't make me feel guilty at all. Rather, it caused me to think of the "daily grind" in a different way - so that I didn't loathe it, but instead find beauty in it.